It is a circular saw with the ability of smooth cutting. It is the best saw which has a very lightweight and brake that stops the motion of the circular blade after pressing the trigger. DEWALT DWE575SB has a stable and serviceable structure that is provided by a ball bearing lower guard. You can cut any material inaccurate shape as you want. The shoe stamp of DEWALT DWE575SB is made by high grade stamped aluminum. If you want a great handy cutting tool then it will be a great feature for you. Dewalt dwe575sb 7-1/4-inch lightweight circular saw with electric brake is lightweight and strong enough to cut any kind of rock-hard material. This cutting saw provides 3x stability. There are some more features that will encourage you to buy this saw. It is the lightest saw with the weight of 8.8 lb. Electric break will assist to fall down the revolution of the blade after releasing the trigger. The motor amp is 15. It helps to cut deeply. The depth of the cut is 29/16. The blower will help you to clear the sight during cutting. Blade storage will help to store the blades and you can change blades easily. The lower guard has an extremely good design which will help you to bevel cuts and cutting shims. The protection system of patented tough cord has 3x durability. When you are using a sharp rotational saw there has to be the safety issue. The blade of the saw rotates at a high speed. So there has a possibility to take place any kind of accident. Sometimes in work, your mind just can go away from the process of work. That is the time when usually accidents happen. A saw worker must know that when he works with a circular saw the blade of the saw has a kickback motion at the time when he touches the blade with the material. But the machine has an anti-kickback feature that won’t let happened any kickback from the machine. Some tool has this kickback motion. But this machine has the electric brake, so after cutting a rod or wood or something else you have to press the electric break which won’t let any kickback from the material. During cutting the flyers won’t let you a clear vision. As a result, you may lose the straight line. The blower will help to cut straight as it will clear the flyers with air. Every new arrival machine gives priority to the safety issue. This machine also gives the priority to the safety of the user. The saw has the weight of 8.8 pounds. It is very light to carry. There is a handle called main handle on the upper part of the machine. To carry this saw you can use this handle and you can use the saw machine by placing it on a table or any other palaces as you want. So you can understand that how light it will be to carry. You can collect this saw for its easy portability. Metal quality is the measurement of how much load the machine can bear. The machine will be a beneficial one if the metal is light as well as a strong one. The saw is made of an extremely good material. You can use the machine on any kind of surface that means the martial of the saw machine is strong enough to carry the load. As the material of the product is good quality it gives a good time of warranty, without making it with the good quality material the product won’t give us a long time warranty as it gives us. You can cut many things by this saw more accurately. It has a maximum watt 1950 which helps you to perform most demanding heavyweight applications. The saw is ideal for concrete formers, remodelers for cutting plywood. And it has a dust blower which helps you see the sight of the user’s line by cleaning the dust. Bevel capacity of the tool is 57 with 22.5 and 45-degree detents. The depth of the cut capacity is 16 inch. The weight of the tool is 8.8 pounds. You can compare the tool with a great competitor like Makita 5007MGA. Makita 5007MGA has most of the features as it has. But you can see from the dewalt dwe575sb vs Makita 5007mga reviews that the DEWALT saw has much lighter than Makita. So precision and accuracy were one of the reasons why I have bought the tool. The saw has some versatility profile. It is 7.8 inches wide and the dimensions of the tool are the 16.25×10.12×10.5 inch and the bevel capacity of the machine is 57 degrees. The power source is corded-electric. Maximum watt of the saw is 1995 watts and it produces 5100 revolutions per minute. So it is very easy to understand the speed of the blade. The depth of the cut capacity is 16 inch. For its good versatile profile, people want to collect this tool for their work. You can also collect this item. If the blade is dull then it will be very much inefficient for cutting. Too much overload on saw motor and splintering increases the possibility of kickback. You have to change the blades when you will feel that extra force need to be applied on the surface of the material for cutting. Extra heat will also remind you that you have to change the blades. The saw has a revolution of 5100 per minute. So it is important to use properly the sharp blade. As a result, you can cut the material easily. You may use kerosene or oven cleaner to remove the hardened gum from the blade. In DEWALT DWE575SB you have to use 5/8* round arbor and the number of teeth must be in 18-36. 18 teeth blade is used for fast cutting and 36 teeth blade is used for giving a perfect finish. So it can be said that more teeth on the blade are used for finer finish cuts. The saw has three years limited warranty. That means you can repair it during this period directly in DEWALT. In addition in warranty, DEWALT offers you 1-year free service contract. That is very much lucrative. The company will also replace the saw parts worn parts caused by normal use and will maintain the tool for free after any time during first-year purchase. From DEWALT DWE575SB reviews you will see that they will give your money back if you are actually not satisfied with the performance of its power tools. They will give you 90 days money back offer if you can show them buying receipt, there won’t be asked any questions. It comes with the feature of the blower. The tool is useful for framers, concrete formers. As they are going to cut anything, there will be produced more flyers and dust. The blower will help to remove them by air. The dust will be collected in a dust port. So it has also the feature of also. It will be very beneficial for any kind of cutting work. Every product has some advantages and disadvantages. The saw has some disadvantages besides its good sides. It has a lower guard design that that increases the performance when you are making leveled cuts and cutting shims. Maintaining the system is easy and it has a blower which helps to remove dust. Easy to carry. It has a handle on its upper side. Breaking system is mind-blowing because it has an electric brake which can stop the blade after 2-3 seconds after the trigger is released. The body of the tool is made by a high-quality material. As it has a lightweight but strong enough to cut heavyweight material. You have to change the blade of the tool frequently. Cutting accuracy is low; you have to be an expert in cutting. RPM is a little lower. What about the rpm of the machine and is it fastest? The RPM of the machine blade is 5200 per minute and it is faster than others. Has it any automatic brake system? Yes, certainly it has. It has an electric brake which does the job after you release the trigger. What are the materials the blade is made of? It is made by 100% gluten-free steel and 0.1% yellow paint. Yes, it is easy to carry. It has a very light weight of 8.8 pounds and has a handle for gripping. Now all of you have understood that why I bought this particular saw. It has some very exceptional and great features that are amazing. These features will push your mind to buy this product. The thing framers and concrete formers are needed most is an electric saw for accurate cutting and fulfill their demands. As I bought this product for my use, I will definitely suggest you buy this for getting better service. 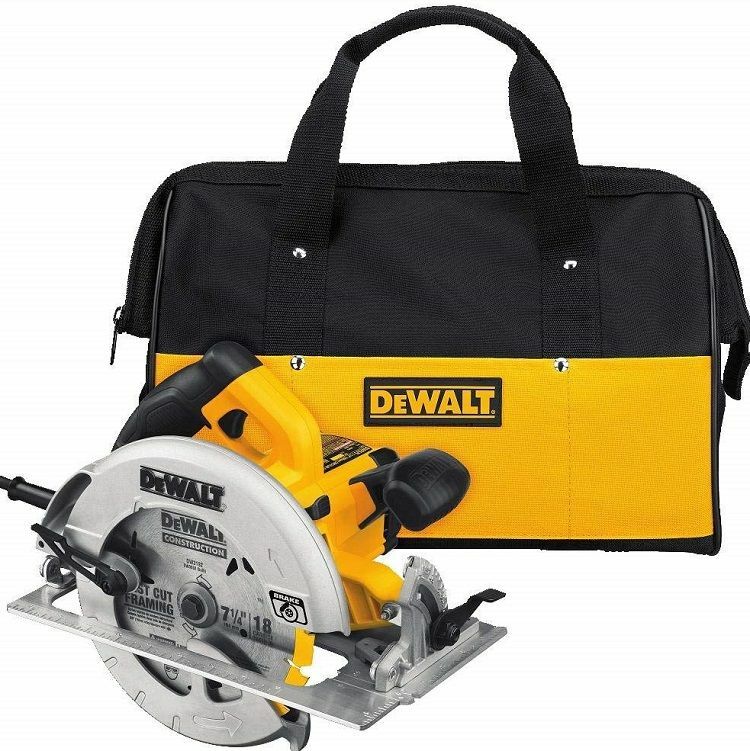 By searching Dewalt dwe575sb home depot you can buy the tool from the marketplace home depot.